Distributor: VHS and R1 DVD available from Central Park Media / US Manga Corps out of print. In the "far future year" of 1995, the material known as "astenite" was discovered, enabling humans to channel their psychic power into mechanical creations, to be used for purposes of rehabilitation and peacekeeping...but others plot to use this power to destroy the impure "Cancer" within their utopia of Cyberwood - and to raise mechanical "gods" of evil from the depths of the Middle Ages. Well, first off, you get this average Johnny-boy (John Stalker, to be exact), introduce his pacifist scientist love interest Leyla, then turn him into this evil machine of destruction that can rip people in half! Isn't that cool? Were we expecting quality from this anime? With a pedestrian name like Cybernetics Guardian, we really didn't. But to hear Adler call his mecha "Genocyber" (no kidding, don't they have *copyrights* in Japan?) ... Well, it seems like the directors wanted to copy every existing nihilistic-futuristic mecha series in existence and combine it into their masterpiece. It sure isn't a magnum opus, but it really, really wants to be Bubblegum Crisis all over again, especially the badly-done wannabe punk rock, which enhances the mediocrity of the anime by conveying exactly the wrong atmosphere during each sequence. Besides, the "psychic energy" looks like mist from a bad '50s movie ... or Tanabe's body odor from Ping Pong Club. And dare we mention the disjointed, rushed, and badly sequenced plot and animation? Remember those *bad* straight-to-cable sci-fi one-o-clock potboilers you'd end up seeing on USA Up All Night or local channels that didn't have the money to put anything better on? 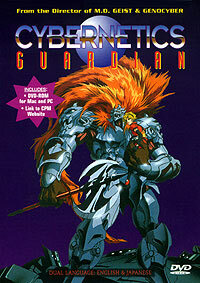 Cybernetics Guardian is exactly the anime version of those movies destined to be heckled at on MST3K. Badly animated, badly choreographed, badly scored, AND badly acted, this thing fails to deliver any serious thrills it could have potentially had. Yes, the film had potential, but the directing and writing were simply laughable. This anime is a "been there, done that, wish I hadn't wasted my money on the rental" kind of flick. At least AIC was smart enough to release only *one* of them. Our verdict: Rent something else. For your own sake. Recommended Audience: Hah! Well, maybe teens would like the heavy amount of gore and violence if the plot weren't so boring. Again, it's a *maybe* for the insomniac crowd, but sleep would be a far better alternative.